Red Fort Built in: Construction of Red fort started in 1638 and was completed in 1648. A Delhi Tour is synonymous with a trip of Red Fort, famously called as Lal Kila of Delhi (Urdu: لال قلعہ‎, Hindi: लाल क़िला). Originally Red Fort was known as 'Qila-I-Mubarak' (Urdu: قلعہ مبارک‎, Hindi: क़िला मुबारक), meaning a residence for the royal family. Comprising of many buildings with intricate carvings, floral motifs, double domes and majestic defence wall of around 2.5 km, Red fort is spread over an area of 255 acres. Built as palace of Shahjahanabad which was the capital city of fifth Mughal emperor it is now one of the most popular monuments not only of Delhi but of India. It was Emperor Shah Jahan who built Red Fort; he also created another popular architecture of India- Taj Mahal of Agra. Owing to the red sandstone used for its construction, this fort is called as Red Fort. With an impressive structure of red sandstone and rich historical background and a prominent national importance, Red Fort Delhi is a place which must be visited by all. Delhi Red Fort has been recognized as a UNESCO world heritage site too. History of Red Fort starts with the very first question of who built the Red Fort. Red Fort was built by Shah Jahan. In the year of 1639, Shah Jahan, decided to shift capital of Mughal Empire Agra to Delhi by the side of River Yamuna. Architect Ustad Ahmad Lahauri was then assigned the task of building the Red Fort. Construction of Red Fort, Delhi was completed in the year 1648. The construction of the fort took almost a decade for the completion. Red Fort is adjacent to another fort named Salimgarh, which was built in 1546 by Islam Shah Suri, the second emperor of Sur Dynasty. Red fort history is not only associated with Mughals but is also symbolic of an important part of India’s past, denoting a timeline of the years it has gone through. The architectural excellence of Red Fort later influenced many other monuments of the country. Red Fort in Delhi, India is not a prominent structure of past but hold equally important place even in present. It is the place from where Prime Minister of India hoists national flag every year on the eve of Independence Day, on August 15th. This has been the tradition since the year of independence in 1947. Red Fort Delhi is the creation of architects Ustad Ahmad and Ustad Hamid. Architecturally, Red Fort or the Lal Quila surpasses many monuments of the world with its carefully planned layout and impressive structure. For instance, if the layout has to be compared, Delhi Red Fort is planned in a better way than the Red Fort of Agra. The first thing that you will notice about the Red Fort is its massive structure and its red colour. 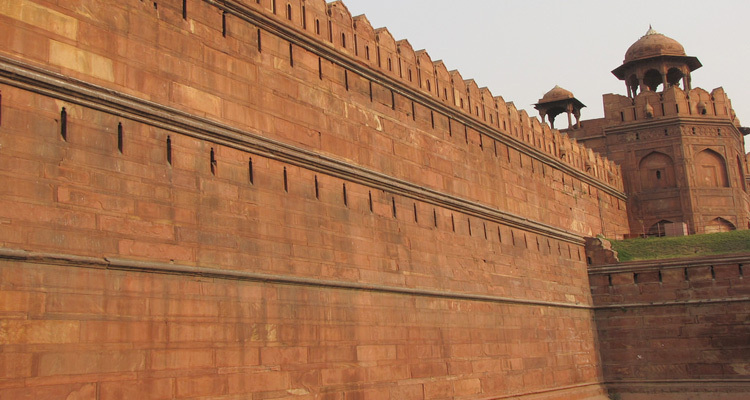 The stone used in red fort is red sandstone, which resulted in the brick red colour of the fort. The fort was used for a wide range of purposes keeping which in mind it has been built. The tallest structure of the fort is around 33 meters high. The Delhi Red Fort is in the shape of an irregular octagon, comprising of long east and west sides along with two main gates on the western side and the southern side. The walls of the fort along with a few parts have been constructed with red sandstone while rest of the part has been built using marble. Some of the prominent sections of the fort that are sure to leave you enchanted are Diwan-i-'Aam, Diwan-i-Khass, Tasbih-Khana, Nahr-i-Bihisht, Delhi Fort Museum- Mumtaz-Mahal, Hammam, Moti-Masjid, Hayat-Bakhsh-Bagh, Chhatta-Chowk, Zafar-Mahal, Rang-Mahal, etc. Later with the advent of British, Lal Qila also came under their rule. Red Fort under British rule went through a lot of changes, in spite of which it didn’t lose the hypnotic charms of its alluring architecture. No description about Red Fort is complete without mentioning Delhi Gate. Located on the southern wall of the Red fort, towards the entrance is the Delhi Gate. Named after the city, the look of this gate is similar to the Lahori Gate of the fort. Also known as Dilli Darwaza, Delhi Gate was constructed during the reign of Shah Jahan, while it has barbican facing the west which was constructed by Aurangzeb. Delhi Gate has three stories, each adorned with arched panels in the rectangular, cusped and square shape which are then bordered by the towers of semi-octagonal shape. These towers are then covered by octagonal shaped open pavilions. The pavilion roof is made up of white stone while the gate is constructed with red sandstone. There are small canopy with seven miniature domes between these two pavilions. These walls have flame shaped fortification. Towards the right side of the gate, the last emperor was kept in captive; this was in year 1857. Between the inner and outer gates, stone elephants without any riders were placed by Lord Curzon. Located on the western wall, Lahori Gate is the main entrance of the Red Fort Delhi. It is undeniably one of the most popular parts of the Red Fort as it is the place from where Prime Minister of India hoists national flag on the eve of Independence Day every year. This has been the tradition since the year of India’s independence in 1947. The name of this gate is derived from the fact that it leans towards the Lahore district of Pakistan. Similar to the Delhi Gate in structure, Lahori Gate of Red Fort also consists of three stories with arched panels in square, rectangular and cusped shape. Semi octagonal towers cover it with open octagonal pavilions. The gate is made up of red sandstone while the pavilions are built of white stone. There is a small covering with 7 domes between the two pavilions. After entering the fort via Lahori Gate, one can see a covered market area called as Chatta Chowk. Located behind the Lahori Gate, Chatta Chowk is a covered bazaar. An important part of Delhi Lal Kila, it presents a glimpse of unique Mughal architecture. The words Chatta Chowk mean covered market. It is a long passage which is in the shape of an arch. This market is consisted of two storied flats which have 32 arched bays. These bays served as shops selling specialized items catering to the needs of the royal household. The items sold in this market range from precious stones, gems, silverware and gold to velvet, silk and brocades. It was in 17th century when Chatta Chowk of Red Fort came into existence after Shah Jahan visited the market of Peshawar in 1646. During 20th century, this market underwent renovations when the arches were enclosed owing to which it lost its original touch. After crossing Chhatta Chowk, you will reach the drum house called as Naqqar-Khana or Naubat. It is the place where ceremonial music used to be played. From here, one enters the Diwan-i-'Am. There is Indian War Memorial Museum on its upper storey. Diwan-i-Aam, as the name suggests is the hall of public audiences. This rectangular shaped hall is the place where Mughal emperor used to meet his pupils; a massive railing was built to separate emperor from the people. Diwan-I- Aam has an alcove with a marble canopy where emperor used to sit and listen to the complaints and issues of the masses. Adorned with stucco work, it is one of the most beautiful parts of the Red Fort. The pietra dura or the parchin kari work on the panels of the throne was created by a Florentine artist named Austin de Bordeaux. Behind this hall, there is a huge courtyard consisting of a range of artistic structures. Red Fort Rang Mahal referred as “Palace of Colours”, is one of the grand harems which was later used as a mess hall by the British after their conquest of the fort. It is a huge hall with an arched façade and domed compartments on both the southern and northern ends. Interiors of this hall have been painted intricately in various colours, which also lead to the name of Rang Mahal. The ceilings of a few of the apartments here are covered artistically with small pieces of mirror, owing to which it is also called as Sheesh Mahal, meaning palace of mirrors. At the centre of Red Fort Rang Mahal, there is marble basin with an ivory fountain. A shallow water channel known as Nahr-i-Bihisht used to flow into this basin. Nahr-i-Bihisht means stream of paradise. Diwan-i-khas is another important part of Delhi Red Fort. Referred as Hall of Private audiences, it is a huge hall with captivating interiors. It was originally used by the Emperor for private and confidential meets with his royal guests and ministers. This chamber is in rectangular shape with arched entrances built on sturdy piers. Floral designs on the piers and carvings on the arches along with ceilings that are adorned with pillared umbrellas make Diwan-i-khas a place worth admiring. Adding to this are the walls of this hall which are decorated with holy verses. At the centre of the chamber, there used to be the famous peacock throne which was late stolen by the Persian conqueror Nadir Shah. The throne is currently displayed in the New York Metropolitan Museum. Khas mahal, referred as the special palace, was the private abode of the Mughal Emperor. This massive structure consists of various parts including a sitting room called as baithak; wardrobe room called as tosha-khana; a sleeping room which is known as khwabgah and Tasbih-khana which is a chamber for counting beads, for the purpose of private prayers. The interiors have been decorated in colourful floral designs with partly golden ceilings. While walking towards the Khas Mahal, on its eastern side you will see a projecting tower called as Muthamman Burj. From this octagonal tower, every morning emperor used to spear in front of the masses. In 1808 Akbar Shah II added a balcony to the Burj. Later in the year 1911, King George V and Queen Mary have appeared before the public from this balcony. Located in the Mumtaz Mahal of the Lal Kila, Red Fort Archaeological Museum presents an interesting display of objects associated with Mughal era. Popularly known as Red Fort Museum or the Palace Museum, it consists of 6 galleries, each boasting of a rich collection. Red Fort Museum displays various items ranging from manuscripts, stone inscriptions, miniature paintings, royal orders and various other items related to Akbar I and other Mughal emperors. There is a separate gallery showcasing a wide variety of jade items such as swords, daggers, celadon, porcelain, tiles, textiles, dresses, carpets, pillows, curtains etc. Bahadur Shah Zafar gallery is one of the most interesting sections of the museum. It displays objects not only belonging to the last Mughal Emperor Bahadur Shah II but also of his queen. Items such as rose water sprinkler, power horns, toilet box, pen holder inkpot, photograph of Bahadur Shah in the prison at Rangoon, etc., are displayed. This museum also contains portraits of renowned court poet like Mirza Ghalib, Bahadur Shah’s letter to Queen Victoria, weapons used by Bahadur Shah and the Nawab of Pataudi, portraits of Bahadur Shah and an ivory painting of Zinat Mahal, etc. This museum is now under the protection of Archaeological Survey of India. Inside the Lal Kila complex, you will also see Hamman which means the place for royal bath. It consisted of three primary chambers, each separated by a corridor. It has been built with marble and designed with colourful stone. There were provisions of hot and cold water in the Hammam. As you walk towards the western side of Hamman, you will see Moti-Masjid, also known as the Pearl Mosque. This mosque was not the part of initial structure of Red fort. It was later built by Aurangzeb. This was used as private mosque by the emperor Aurangzeb. This mosque consists of three domes with copper plating and doors had copper plated leaves carved on them. There are slightly elevated prayers mats built with black marble in the mosque. These are known as musalla. To the north of Moti Masjid, there is Hayat-Bakhsh-Bagh, the Life Giving garden. This garden, planned around the main structure of Red Fort Delhi is adorned with fountains, tunnels, tanks, landscapes and a rich collection of plants. There is also a small garden inside the Lal Quila which is known as Mehtab Bagh, the Moonlight Garden. In the middle of the Hayat-Bakhsh-Bagh is a pavilion built with red stone called as Zafar Mahal. It was built by Bahadur Shah II in the year 1842. The minimum time that one needs to see Lal Kila Delhi is around 2 hours which can even go up to 3 or 4 hours if you are planning to explore its every part thoroughly. Take some time out and visit this fort at leisure with ample of time to take breath taking Lal Kila photos. One of the major attractions of Lal Qila Delhi is the light and sound show. The Red fort sound and light show is conducted in Hindi and English languages. Started in 1996, this show became immensely popular among visitors soon after its start. Here, the modern technologies are combined to present a peek into the historical grandeur of ancient India. One of a kind, this show is around 1 hour long. The shows are organised in the evening, with an interval of one hour between them. As the shows starts, with the lighting and accompanying sound, Red Fort gains an impressive appearance. The emphasis is majorly on the history of the Mughal reign and its role in the construction of Red Fort. Tickets for the light and sound show can be bought from the ticket booth at the Red Fort. Tickets are available till 1 hour before the show starts. Ticket price for Red Fort sound and light show is Rs.60 per person for adults during weekdays while on weekends it is Rs.80 per person. For children, during the weekdays, sound and light show charges are Rs.20 per person and Rs.30 per person on weekends. Red fort light and sound show timings are 7.30 PM to 8.30 PM for Hindi show. For show in English language, the timings are from 9 PM to 10 PM. This is from the month of May to August. During the months of September and October, the timings for the show are 7 PM to 8 PM (Hindi) and 8.30 PM to 9.30 PM (English). During the months November to January, timings are 6 PM to 7 PM (Hindi) and 7.30 PM to 8.30 PM (English) while from February to April it is from 7 PM to 8 PM (Hindi) and 8.30 PM to 9.30 PM (English). Entry fee of Red Fort for Indian citizens is Rs.35 per person while for foreign tourists it is Rs.500 per person. For the tourists from SAARC countries (Sri Lanka, Bangladesh, Maldives, Bhutan, Pakistan, Afghanistan and Nepal) and BIMSTEC Countries (Bhutan, Nepal, Sri Lanka, Thailand, Bangladesh and Myanmar), the red fort entry fee is same as that of Indian citizens, i.e., Rs.35 per person. Located on the bank of Yamuna River, Red Fort lies in the present Old Delhi. Reaching Red Fort is not a difficult task as it is well connected via public transport. There are many regular buses from central New Delhi and also from Delhi airport to Red Fort. It will take around 30 to 40 minutes of travel time to reach the Delhi Fort. While if you are travelling by car, it will take around 15 minutes to reach the fort from Central Delhi. One of the best modes of transportation in Delhi is via metro railways. Not only faster, it is also cost effective. So, if you are travelling via metro, you need to get down at the nearest metro station which is Chandni Chowk. From Chandni chowk, you can hire an auto rickshaw or even walk up to the fort. From Chandni chowk Red Fort is only 1.6 km away. Who built Red Fort in Delhi, India? Red Fort Delhi was built by Mughal Emperor Shah Jahan when he shifted the centre of Mughal power from Agra to Delhi. Shah Jahan then assigned the architect Ustad Ahmad Lahauri with the fame of building Taj Mahal, the task of building the impressive Red Fort. When was Red Fort in Delhi Built? Red Fort in Delhi was built in the year 1648. Its construction was started in year 1638, on the holy month of Muharram. It took around 10 years in completing the construction of Lal Kila. In which year Red Fort was Built? Red Fort was built completely in the year 1648, while the construction was started in the year of 1639. Why was Red Fort Built? Red Fort in Delhi was built when Mughal Emperor Shah Jahan decided to shift the capital of Mughal regime from Agra city to Delhi. Hence, in 1639, he commissioned construction of the Fort near the Yamuna River, in the north eastern side of the Shahjahanabad, which is currently known as Old Delhi. It took around a decade for building Red Fort in Delhi. Is there any Parking Facility at Red Fort? Parking facilities are offered for the visitors at the Red Fort. There is parking facility near the Sunehri Masjid. From here visitors can enter Lal Qila through the Lahori gate. What are the timings of Red Fort, Delhi? Entry timings of Red Fort Delhi are from 9.30 AM to 4.30 PM. Tourists can visit the fort throughout the week except on Mondays. Who is the Architect of Red Fort? The architect of Red Fort is Ustad Ahmad Lahauri, who is also said to be the architect of Taj Mahal. What material was used in construction of Red Fort? Materials that were used in the construction of Red fort are red sandstone and the marble. Where is Red Fort Located in Delhi? Delhi Red Fort is located on the Netaji Subhash Marg in the New Delhi. It is around 2 km from Old Delhi railway station and it is around 1.6 km from Chandni Chowk Metro Station. What is Red Fort Delhi Address? The exact address of Red Fort Delhi is Netaji Subhash Marg, Chandni Chowk, New Delhi – 110006. 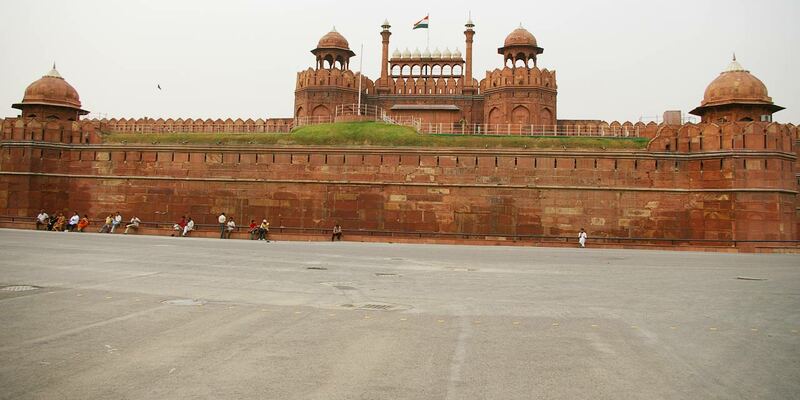 What is the area of Red Fort, Delhi?